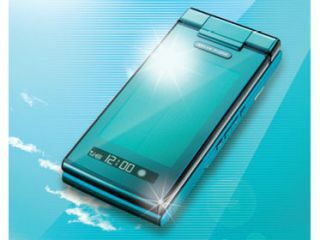 Sharp has decided that the lack of plugs by the sea is just too much to bear, so has released the world's first waterproof and solar-powered mobile phone. While some of you may recall a couple of efforts from the likes of Samsung and LG in Barcelona last February, Sharp (in association with Japanese network KDDI) has beaten them both to the punch. The phone is scheduled for a release in June, although there's no word if it will actually make it out of Japan. That said, these handsets are largely aimed at developing nations (ie those where an electricity grid is scarce) so it's likely they'll ship worldwide. The solar panel, placed on the top of the handset, will give enough charge for one minute of talk time or 2 hours on standby from just 10 minutes in the sun, so fall asleep on the beach for an hour or two and not only will you be burnt to a crisp, you'll be able to tell your friends in a 10 minute conversation! The solar panel can contribute up to 80 per cent of the total power of the handset, so you should be able to nab some sun-charge to see you through a day or two if needs be. This is the latest in a growing line of environmentally friendly handsets, and we expect to see more in the coming months as the big names start to feel a bit bad about all the dying animals and melting ice caps.